The official UK reaction to whistleblower William McNeilly’s report on security lapses on Trident nuclear submarines is an insult to the public and the claims need to be investigated further, WikiLeaks spokesman Kristinn Hrafnsson told RT. The allegations haven't received much attention in the British media, and WikiLeaks founder Julian Assange said he suspects there is a "standing D-Notice on all Trident nuclear weapons issues," meaning the media has been warned by the military not to report on the matter over security concerns. RT:Why do you think such a warning might have been issued and what exactly is the media banned from covering? Kristinn Hrafnsson: Well, I don’t have a confirmation of course about the existence of the D-Notice. But it is noticeable that the British media is mostly avoiding these very serious allegations set forth by McNeilly in a very detailed report. Of course at the outset it was dismissed by the Ministry of Defense, and it was downplayed in the usual way when you deal with whistleblowers. He was said to be sort of a lower rank and now knowing what he was talking about, etc. But there is a way to silence whistleblowers, and that is by simply ignoring them. If it is not a D-Notice, then certainly the British media is mostly ignoring these serious allegations. They have failed to investigate thoroughly a very detailed report by able seaman McNeilly. RT:I suppose the other side of the coin is that if these claims are true, it would make a lot of sense not to allow the media to cover such a sensitive security issues, wouldn’t it? 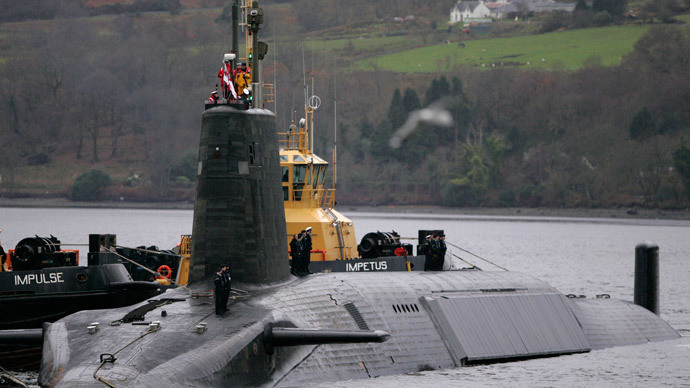 KH: If these claims are true, it is a very serious blow to the Trident program. And you could see the very serious concern by the parliamentarians from Scotland. I think all MPs from Scotland from the SNP, the Scottish National Party were attending this afternoon’s debate in Parliament, where there were only about five Labor MPs and just a handful MPs from the government. This is a very serious issue of course, and it is very strange that it is being brushed off almost. Today, the Minister of Defense issued a statement - a 500-word statement - addressing the detailed report by McNeilly dismissing all claims, claiming they were based on misunderstanding, or that he did not understand what he was talking about, which is very strange indeed. And I agree with Salmond, the MP from Scotland, and all the MPs who said in the House this afternoon that that statement, that short statement as a reply to a series of allegations, is an insult to the public. RT:London has completed an inquiry into McNeilly’s allegations and says no safety breaches have been found – will that be enough to ease the public’s concerns? KH: I doubt that it will ease the concerns of people in Scotland, who have to live with these possible dangers in their neighborhood. And I hope that the media will pick up and actually try to investigate thoroughly the matter. The reply by the government reeks of being a whitewash.